1-5 pound beef or bison chuck roast bone-bone in dusted with flour, salt and pepper. Sear in hot Dutch oven until browned on both sides, I used the Ninja cooker high stove-top setting. Toss in the vegetables and herbs while the second side of the beef is browning, deglaze with wine, stir the pot for a minute or so to reduced the wine a bit, add in all of the tomatoes, herbs and gently season with salt and pepper. Simmer or slow cook for about 4 hours. Remove meat from the soup and shred or chop then add it back to the pot and slow cook for another 2 hours, checking the broth level and adding more if necessary. When soup is done you can choose to cook up a pot of tubetti, acine de pepe to add to each bowl of hot soup or try cooked barley. Another option, some frozen mixed vegetables. 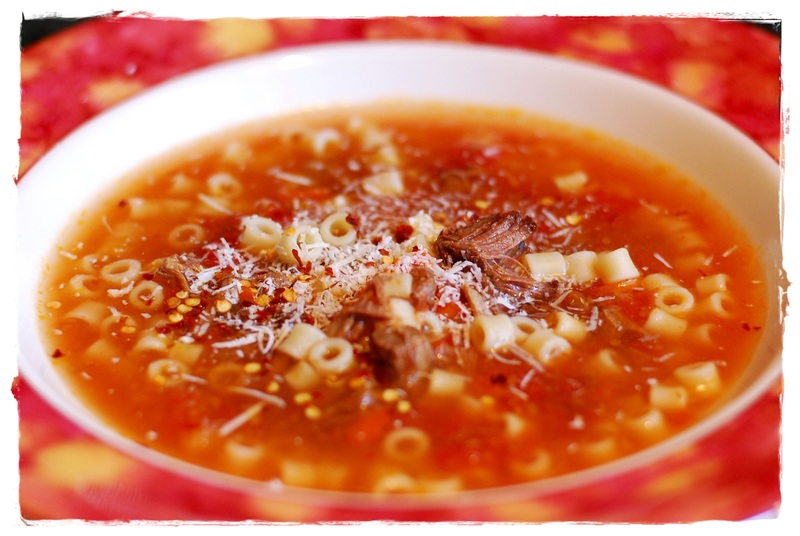 I love a good grating of Romano and Parmesan over the hot soup.